The non-verbal part of the brain is concerned with spatial relationships – how deep is that curve, how long is that line, what is the angle between here and there? When it is active, or ability to label what we’re seeing falls away and we see only the whole image as a collection of masses to be described in relation to each other. The shift to non-verbal processing can be made more difficult by the verbal brain’s habit of attaching preconceptions to how things look (symbolic form language). We can assist the shift away from the symbolic by drawing things that are unfamiliar, confusing the verbal brain and letting the visual brain work with no notion of how things should look. Faces are notoriously easy to recognise, even upside down, although the Thatcher effect and our ability to see faces in clouds or wood grain suggests that that ability is based on the configuration of facial features rather than detailed observation of component elements. Learning to draw is learning to access non-verbal thought processes by directing your attention towards visual information the verbal mode can’t process. I would argue that this bypassing of the everyday thought process, along with the sense of ‘lost time’ when emerging from the visual mode of processing, makes drawing an altered state of consciousness. With that concept in mind, I can provoke the shift to visual-mode by using similar tools to the ones I use to start meditation – breathing exercises, music, scent, or some small preliminary ritual (perhaps sharpening pencils and laying them out). I struggled to keep focused during the face/vase exercise. My mind kept wandering to thinking about the books I was reading or plans for the future, and I’m not sure if I managed the mental shift at all. This exercise was done during a business trip to the States, so I’d argue that jetlag was a factor, but equally, Edwards did warn that the shift couldn’t be observed and I was looking for it. On the first try, filling in the right profile, I couldn’t see the face by the time I got to the chin, and went back to correct the ‘vase’. I experienced the mental block Edwards describes and overcame it by concentrating on the angles, line length and proportions on the line I was drawing. I did the left-handed task as well, to see what the difference was and also have another got at the task. It was a lot harder, mainly because I couldn’t see the line I was supposed to be copying, but I again I struggled to reach the correct thought mode. 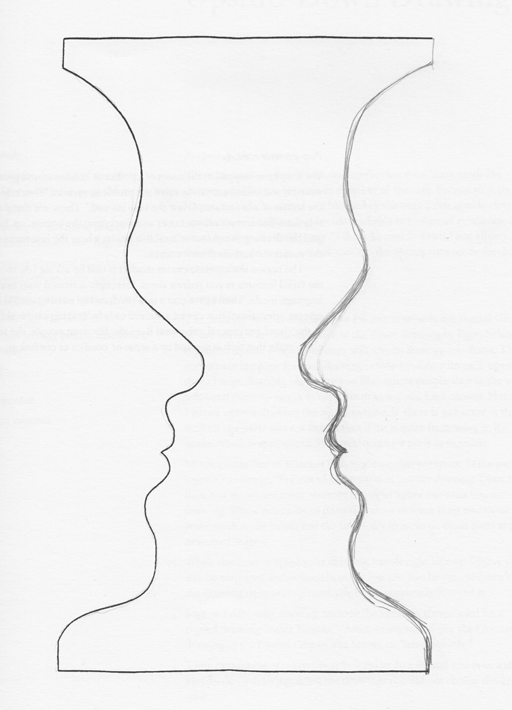 In all of the pictures, the face was the hardest part to draw; the ability to recognise a face or hands – even upside down – was surprisingly hard to overcome. 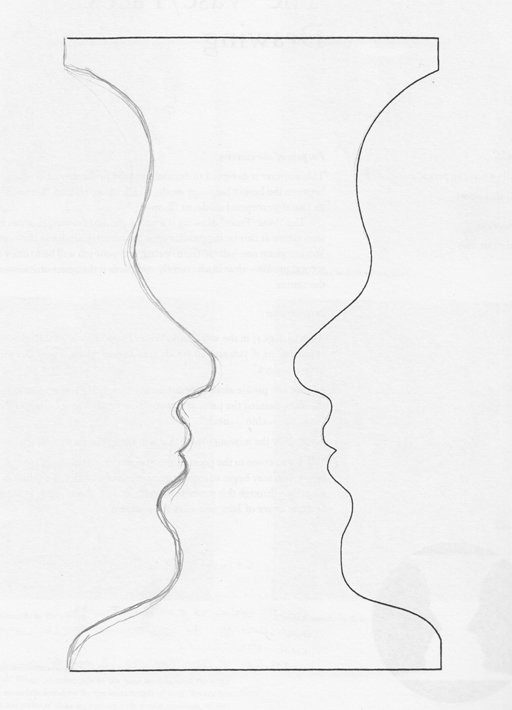 As with the face/vase illusion, I had a lot of mental chatter and ignoring it led to increasingly emotive subjects (imagined conversations, ‘what if’ scenarios, anxieties, regrets). At one point during the first drawing, my mind simply repeated the phrase ‘this is boring’ and pointing out how uncomfortable I was and urging me to take a break. Although I was largely able to ignore the intrusive thoughts, it was difficult to stay on task. For the second task, I began blocking in approximate masses before drawing and found that very helpful (Edwards said to copy the picture, she never specified how to go about it), but in the third drawing, my mind wandered completely, resulting in glaring inaccuracies. During the fourth drawing, my partner was playing music in another room and that gave my verbal thought processes something to puzzle over, resulting in fewer distractions and considerably fewer inaccuracies. Once the music switched off, the distraction returned, but I was already engaged with the picture and able to finish with minimal fuss.